Lower TV Pricing + More Channels! 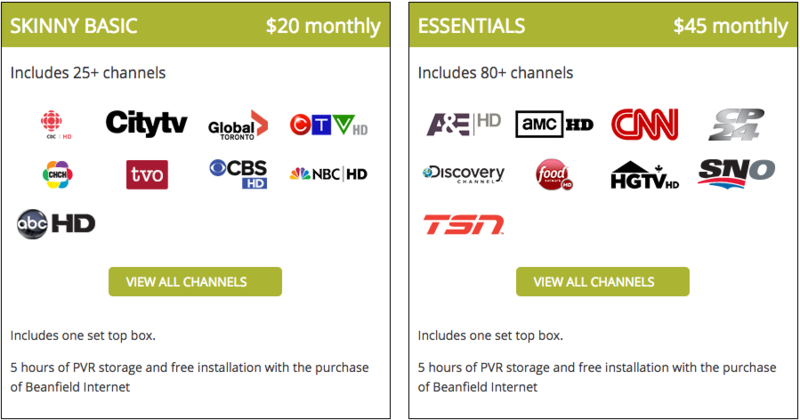 Beanfield is excited to announce new changes to our TV services and to our pricing! Our customer feedback survey garnered great responses about our Internet and TV services, and we want to thank everyone who participated. We are thrilled to see how passionate our customers are about Beanfield and we truly took your feedback to heart. Effective immediately, we’ll be giving you what you asked for by lowering the cost of our two most popular TV packages for all existing and new customers. We’ll also be offering the same great content PLUS even more channels for all your viewing needs. You read correctly – More for Less! $15 per month + $5 per month set top box rental fee. A savings of $7 per month. $40 per month + $5 per month set top box rental fee. A savings of $27 per month. No duplicate channels. No radio channels. Existing TV customers currently paying the $7.00 rental fee, will see it reduced to $5.00 per month (per set top box). This totals $20.00 per month for Skinny Basic and only $45 per month for Essentials. Existing TV customers who paid the $150 one-time charge will not pay the rental fee listed above. This means you will now only be paying $15 per month for Skinny Basic and only $40 per month for Essentials. You’ll see our new lower pricing reflected on your first June invoice. In an effort to improve your TV experience and our ever-expanding selection, we’ve added several new channels to our packages and a la carte lineup. We’ve also restructured some theme packs to ensure you’re getting the channels you want to see most. If you have an existing theme pack, our Customer Experience team will reach out to you and let you know about the improvements to your current package. We understand that watching TV on your own schedule is important. That’s why we are continuously working on advancements to PVR that you’ll see rolled out in the near future. We’re also excited to announce that Video on Demand and Go Services are in the works. Stay tuned! If you have any questions about your existing services or you would like to take advantage of our updated TV packages, please reach out to support@beanfield.com or call 416.532.1555 and a Customer Experience Representative will be happy to assist you.